The sun shined very briefly this morning, right after I took these pictures; yet, I think you will be able to enjoy them. 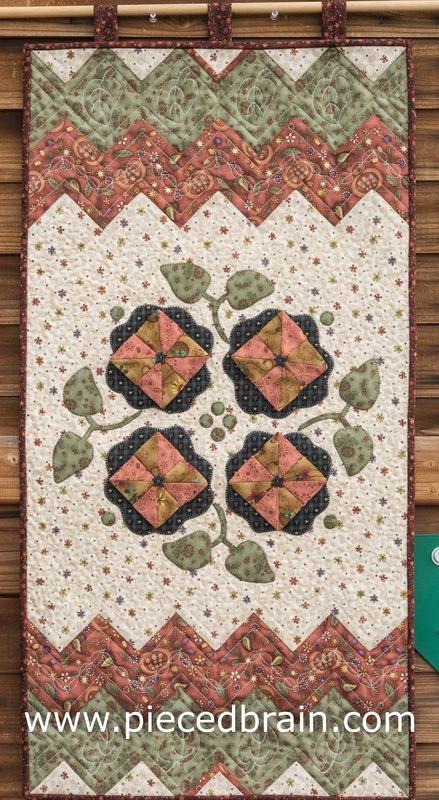 I am really happy with this wall hanging called "Studio Garden" - when I made it there were no flowers outside, so I had to make up my own in my quilting studio. The wall hanging is 35" long and 18" wide and is fat quarter friendly. There is a lot of machine applique in this wall hanging, including the flowers, leaves and stems, and... surprise - the borders! 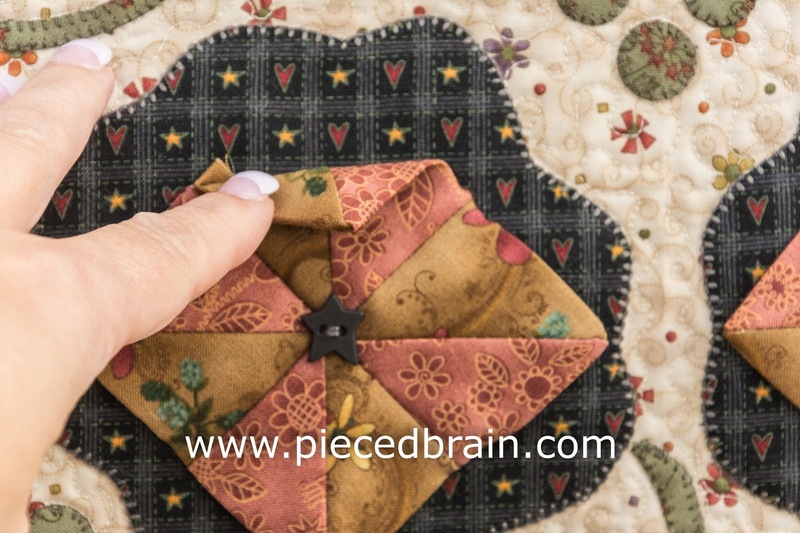 No triangles were sewn: those appearing on the borders are cut from a template, fused using HeatnBond Lite and appliqued to the quilt with blanket stitch. I worked with Aurifil threads: piecing with 50 wt, appliqueing with 40 wt, and quilting with 50 wt also. 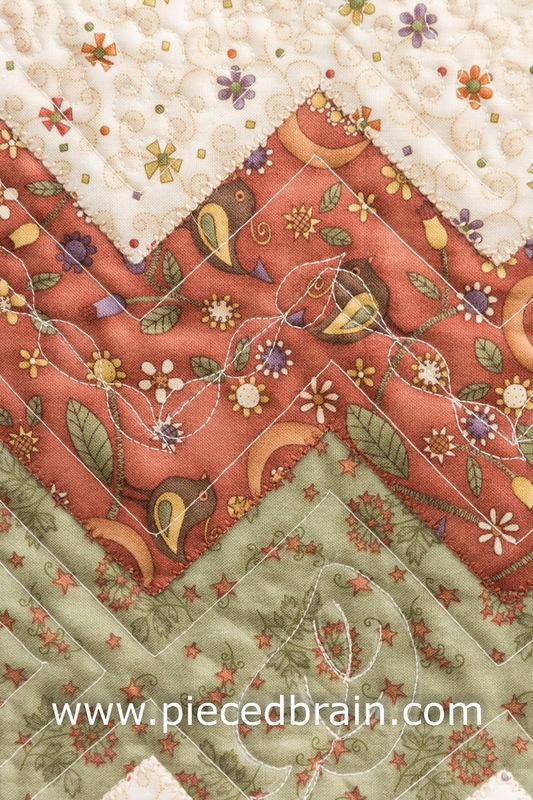 The quilting has a soft, delicate feel to it, which you can easily achieve using Aurifil 50 wt as it is thin yet strong. Another surprise on this wall hanging: the pinwheels are 3D, a technique I came up with which is different from the 3D pinwheels out there. They are tacked to the background flower by hand at four seams, then at the center when you hand stitch the button on the center. 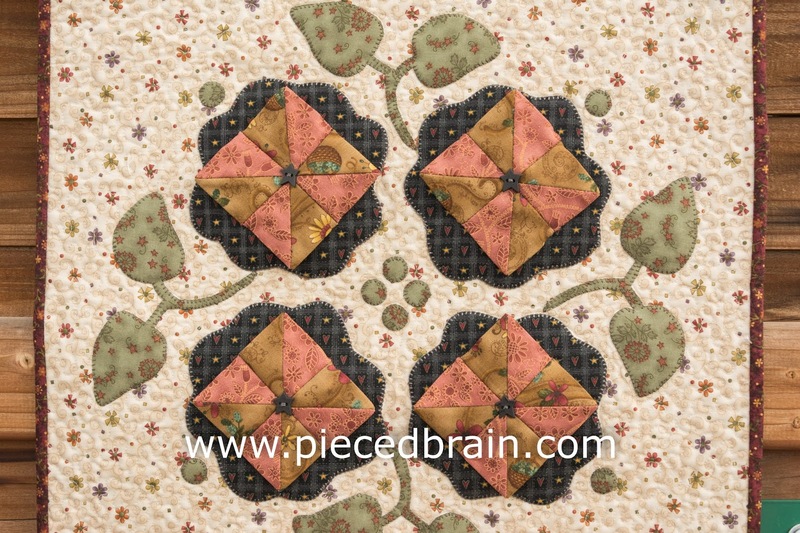 I am a happy quilter today! I am linking this post to Crazy Mom Quilts, Confessions of a Fabric Addict, Quilt Shop Gal, Forth Worth Fabric Studio, Link-a-Finish Friday, and My Quilt Infatuation. Before I leave: Block #13 of the City Girl Sew Along is ready. Check it out! What a sweet quilted walhanging. I love the design, colors and fabrics. Total #CreativeGoodness. Beautiful fabric choices and very well made - great work! Love this little quilt! Great colors and design. I'm also admiring the neat blanket stitching and wondering what machine you used? I'm researching machines to buy and this stitch is an "important qualification" as I have so many fused applique patterns and kits I'd like to start stitching on... lol!